This Wooden A-Board can be Seen From Either Direction! Each Sidewalk Sign has Black Writing Surfaces. 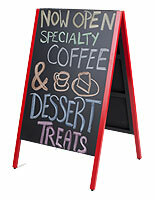 The Wooden A-Board can be Written on With Either Wet Erase Pens or Stick Chalk! 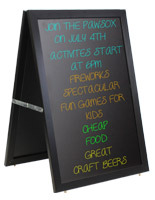 18" x 28" 20" x 42"
Matted textured blackboard for use with wet erase markers, liquid chalk, or stick chalk. 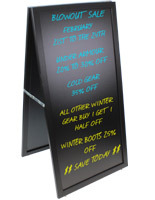 Double-sided blackboard for maximum visibility. 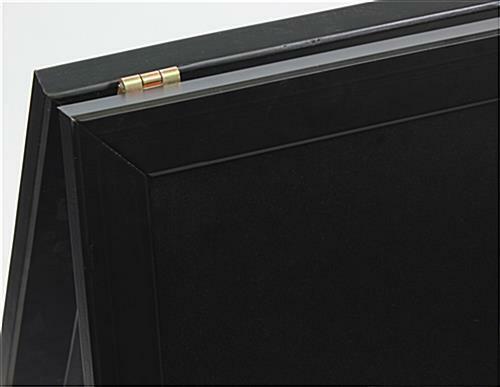 Hinged wood frame with a black finish easily closes for transporting & never over extends when open. (2) 24"w x 36"h Writing surfaces for bold advertisements. This wooden a-board, called a sidewalk frame, has two sides. The sandwich sign has (2) large writing areas of 24"w x 36"h. Each wooden a-board that can be drawn on has the ability to be written on with wet erase markers, liquid chalk, or stick chalk. Each sidewalk sign can have a different advertisement displayed every day. This wooden a-board that is easy to clean can be wiped clean with a damp cloth! The sandwich frame also comes with a magic eraser for some tougher cleaning jobs. This wooden a-board takes seconds to clean. The sidewalk frame is ideal for restaurants to display the evening specials or nightly entertainment. Each restaurant display, wooden a-board has two sides. The sidewalk frame can be seen from either direction. This wooden a-board that is lightweight folds for quick storage. Each sandwich sign takes just minutes to set up. The wooden a-board fits in most vehicles. The sidewalk sign's hinges allow the unit to collapse closed with ease. Each wooden a-board has a middle hinge keeping the display from opening up too far. The sandwich sign is meant for indoor use but can be used outside under fair weather conditions only. 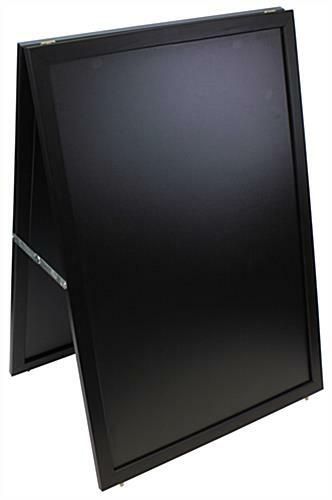 The sidewalk display's black finish frame is the perfect tool to fit any décor! 27.0" x 38.5" x 21.0"